One of my many obsessions is photographing sunrises. There is nothing like the peace and stillness just before sunrise. On a beach, the gulls gather to swoop up their breakfast; in Eze de Provence, one can hear the distant fishing boats below, in Villefranche sur Mer, pulling in their catch; at the Polynesian Village spectacular sunrise skies foretell of the soon-to-be-fulfilled fantasies; and from my own back porch long shadows serve as backdrop for garden warblers. 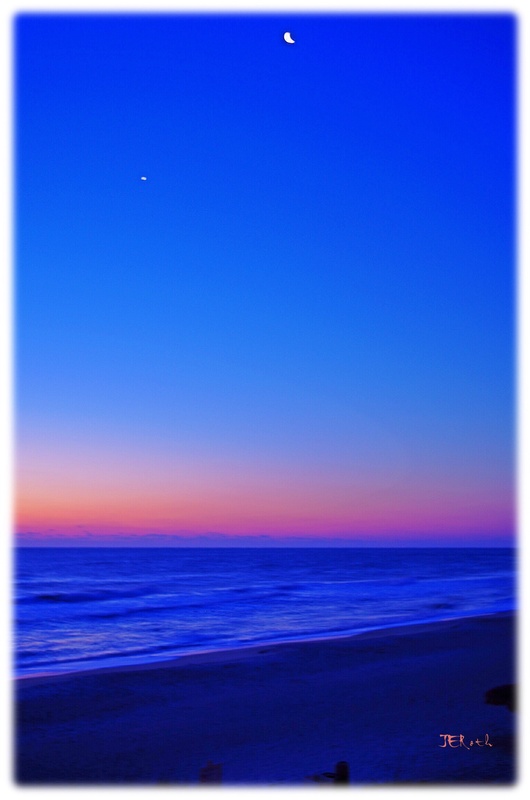 But this March 27, 2014 morning in Ponte Vedra, I was stunned by the stellar spectacle of a sliver crescent Moon hanging with a super-bright Venus, in the still dark, pre-dawn sky, giving a whole new dimension to my sunrise obsession. I was lucky to wake up so early,and brave the chilly pre- dawn air. I didn’t have a tripod so I had to lean on the balcony. Love you!